It's all about who you know. Think of your favorite bands from music history — FiveBands will tell you about five other great bands that shared members, gigs or venues. Listen and learn! Joe Poliseno, Louis Bova, Miki Zone, and Paul Zone backstage in 1979. 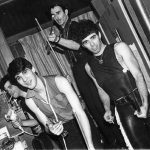 With a performance history that stretched from 1973 to about 1984, The Fast were among the most enduring of the first wave of New York punk bands — seminal but largely overlooked by mainstream rock history. The band, built on the efforts of brothers Mandy, Miki and Paul Zone, made a mark at locations like Max’s Kansas City and Coventry and arrived early to the party at CBGB, playing with bands such as The Ramones, Blondie, The New York Dolls, Johnny Thunders‘ Heartbreakers, Suicide and The Misfits. The Fast is also a testimonial to the LGBT roots of New York’s musical underground in the 1970s, playing an assortment of gay clubs in the city and beyond and eventually trading the Fast name for Man 2 Man. Do you know 5 bands?